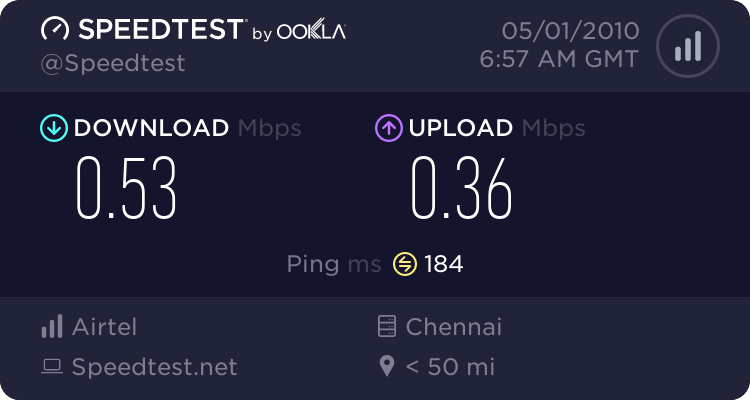 My friend Krish recently pointed to the fact that Airtel was doubling speeds. The original Airtel press release indicated that minimum default speed will be 512kbps going foward. Now, I'm there @ 512kbps download speed as evidenced below. Yahoo!!! Look at the ping test results. While I'm not fully sure of what the implications are yet, the line quality appears to be concerning (or maybe its a function of test time of day, server load, etc). Grade D: Concerning. Most online applications will not perform well but should function is some capacity. Test to other servers to confirm. Grade B: Very good! Your connection should work well for any Internet application. Some online games may not perform optimally.